If you will believe it, I haven't just been lazy about posting oatmeal cookies. 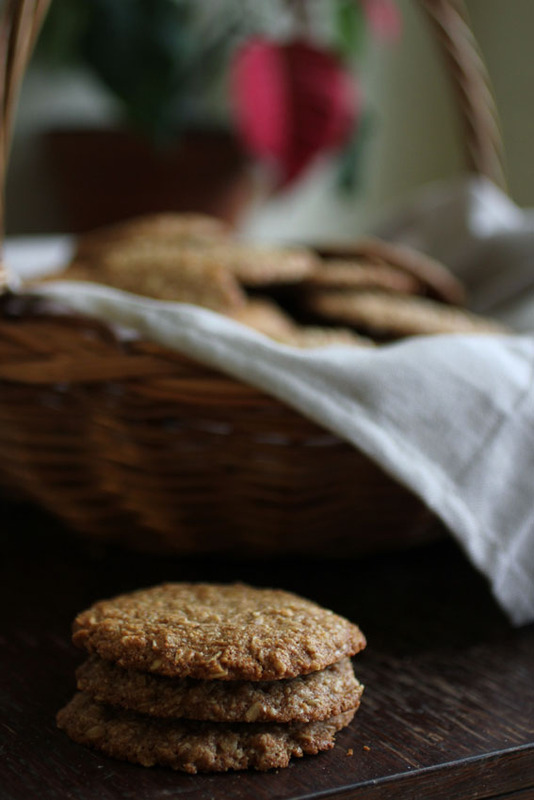 It actually took me a month of obsessive oatmeal cookie making to arrive at this recipe. Creating an oatmeal cookie for my dream bakery was way more difficult than I anticipated...in part because I struggled to define my "perfect" oatmeal cookie, but also because of the increased number of variables to consider, adjust and change, especially compared to a basic shortbread or sugar cookie. But here I am...finally ready to present to you my oatmeal cookie. It's hearty, spicy, dense and chewy, with quite a bit of spread. I've eaten so many versions of them in the past month, but I still can't keep myself from eating the entire first batch of every trial run. I love them. However, rather than claiming that I've reached perfection, I'll say that I've reached the limit of my ability (or desire) to create my perfect oatmeal cookie—this is the best I can do...for now. 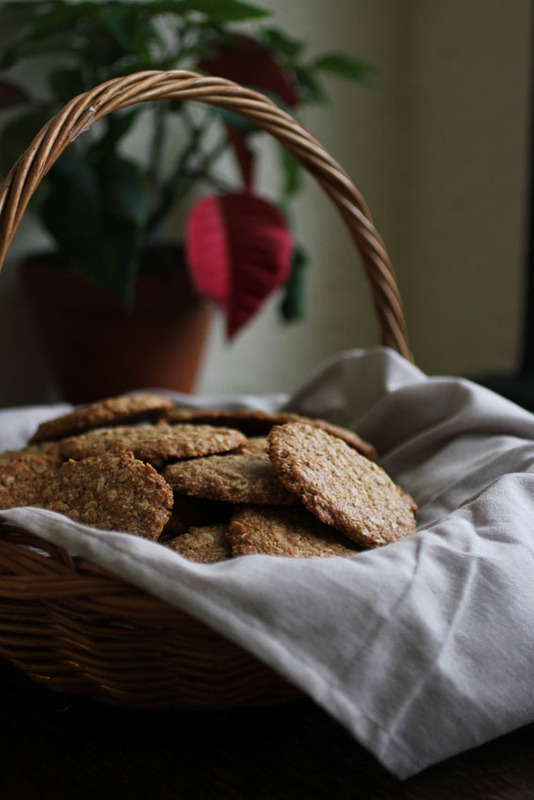 Though I'm not working on the same scale or skill level as Stella Parks, her recent blog post inspired me to just let my oatmeal cookies go...or else I might be making them everyday for the rest of my life. Now, about the actual recipe... I used oat flour to increase the oatyness of the cookies, without adding the tough chew that comes from too many oats. You can make the oat flour at home, finely grinding oats in a coffee or spice grinder, or use store bought, if you can find it (Bulk Barn has it). I like the richness the almond flour adds, and baking the cookies at a lower temperature allows them to achieve a nice spread—I like a flat, chewy oatmeal cookie...no puff balls for me. Also, I like them a bit under baked...a bit unset in the middle; bake them a couple minutes longer for a crisper cookie. In other, exciting news...I'm moving again! I've long known city life is not the life for me, so, with a job offer at a cute bakery, I've decided to move to Muskoka for the summer. Although I'm confident this means more happiness for me, it also means I won't have access to a personal kitchen...so there will be few, if any, blog posts in May, June, July and August. I'll be back in September though. Wish me luck! 1. In a large mixing bowl, sift together dry ingredients. 2. In another large mixing bowl, cream honey and coconut oil. Add egg and vanilla extract and beat until combined. 3. Add dry ingredients to wet, and mix until combined. 4. Portion cookies, about 28 grams per cookie, onto a cookie sheet, allowing room for spread. Flatten dough balls to form discs about 1.5 cm thick. 5. Bake at 325F for 10-12 minutes, until golden brown on edges and slightly pale in the center. 6. Allow to cool briefly before transferring to cooling rack to set. There are worse ways you could spend everyday for the rest of your life. But these look excellent! I like that there's nutmeg in them. That's so exciting about your move - Muskoka looks so beautiful! Maybe Katie and I will have to visit? And also eat these cookies.